When you’ve been in real estate a few decades, you start to get the hang of it. 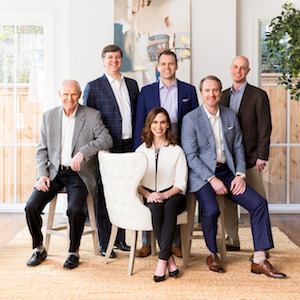 The Rhodes Group has been helping people buy and sell homes in the Park Cities (Highland Park & University Park), Preston Hollow, Devonshire, Greenway Parks, Bluffview, Briarwood, and East Dallas (M-streets & Lakewood) neighborhoods for two generations. They grew up here, immersed in the ebbs and flows of the local neighborhood markets. Deep ties to the community keep them in the know about “off market” opportunities and hip pocket specialties. Their extensive market knowledge, thorough understanding of data trends, and expert contract negotiations coupled with impeccable service have set them apart. The Rhodes Group’s strategic partnership with Compass provides their clients with a platform unmatched in the industry. Compass fuses the best of a national brokerage with the technology and culture of a startup, putting them - and their clients - in the best possible market position. In fact, they’ve sold an average of one home every 2.5 days for the last 10 years and have an over 82% repeat and referral rate. If you’re thinking of buying, selling, or just can’t decide, contact The Rhodes Group. They’ll provide an honest assessment and insights based on experience you just can’t get anywhere else.